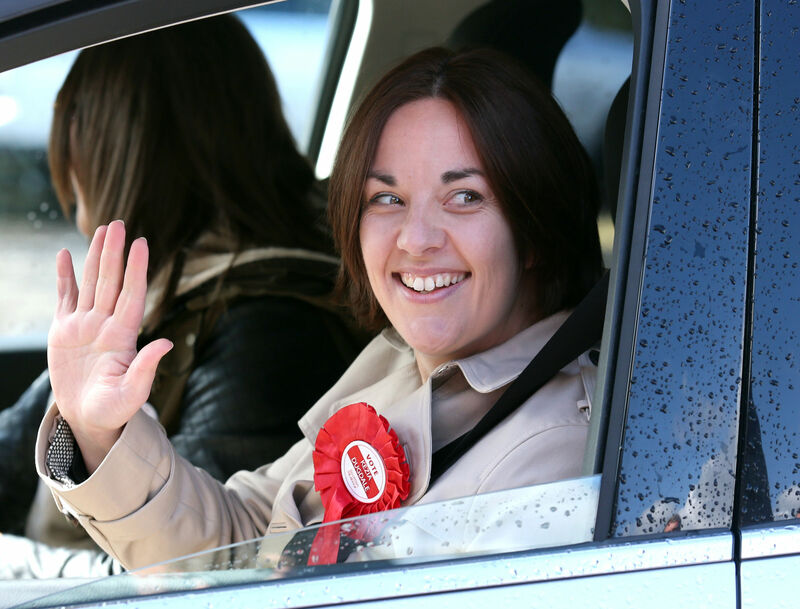 Scottish Labour leader Kezia Dugdale waves during a visit to Wonderworld soft play centre in Glasgow . Labour’s Kezia Dugdale insisted she is “immensely proud” of the campaign her party has fought as the race for Holyrood entered its final 48 hours. The Scottish Labour leader said her party is “really upbeat” and “really focused on the final few days of the campaign”. She was speaking as she took her campaign, which has focused on using new tax powers coming to Holyrood to raise additional cash for public services, to a softplay centre in Glasgow. Her visit came as another poll put Labour and the Tories neck-and-neck in the fight to be the official opposition. While the SNP are comfortably ahead and expected to win another majority at the Scottish Parliament on Thursday, Ms Dugdale said First Minister Nicola Sturgeon may regret posing with a copy of The Sun newspaper. The paper has been boycotted by some Liverpool fans for its original coverage of the Hillsborough tragedy, in which 96 football fans lost their lives, and an inquest ruled last week they were unlawfully killed. In the same week the Scottish Sun gave its backing to the SNP, with a front page picture showing Ms Sturgeon holding a copy of the paper. Labour argues Scotland would be £3 billion better off under its plans, which would see the basic rate of income tax increased by 1p north of the border, while the top rate, for those earning £150,000 a year or more, would go from 45p to 50p. “We’ve got a simple, honest message that the Labour Party has a plan to stop the cuts,” Ms Dugdale said. That could see £336 million more spent in Glasgow, according to Labour, with an additional £276 million for Edinburgh and £137 million for Aberdeen. Ms Dugdale said: “I’m immensely proud of the campaign Labour has run because we are the only party that has actually been talking about ideas about Scotland’s future, about how to transform the country with the powers the Parliament has, and we’ve done that by being bold and honest about tax, and asking the richest people in society to pay a bit more tax.